Appearances don’t always reveal the truth. Grace Latimer knows this better than most. Illusions of commitment and comfort have her trapped—until bohemian adventurer Nick Heysham charms his way into her world. Commissioned to recover a Great Exhibition architect’s missing designs, he persuades her to assist in his research. The mystery of the Crystal Palace seduces Grace, and once she discovers clues about a forbidden Victorian love affair, she’s lured into the deep secrets of the past…secrets that resemble her own. My father was a soldier and most of my childhood was spent moving from place to place, school to school, including 03_Merryn Allinghamseveral years living in Egypt and Germany. I loved some of the schools I attended, but hated others, so it wasn’t too surprising that I left half way through the sixth form with ‘A’ Levels unfinished. I became a secretary, as many girls did at the time, only to realise that the role of handmaiden wasn’t for me. Escape beckoned when I landed a job with an airline. I was determined to see as much of the world as possible, and working as cabin crew I met a good many interesting people and enjoyed some great experiences – riding in the foothills of the Andes, walking by the shores of Lake Victoria, flying pilgrims from Kandahar to Mecca to mention just a few. I still love to travel and visit new places, especially those with an interesting history, but the arrival of marriage and children meant a more settled existence on the south coast of England, where I’ve lived ever since. It also gave me the opportunity to go back to ‘school’ and eventually gain a PhD from the University of Sussex. 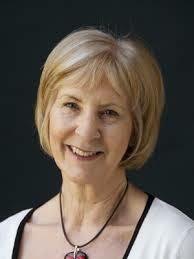 For many years I taught university literature and loved every minute of it. What could be better than spending my life reading and talking about books? Well, perhaps writing them. I’ve always had a desire to write but there never seemed time to do more than dabble with the occasional short story. And my day job ensured that I never lost the critical voice in my head telling me that I really shouldn’t bother. But gradually the voice started growing fainter and at the same time the idea that I might actually write a whole book began to take hold. My cats – two stunning cream and lilac shorthairs – gave their approval, since it meant my spending a good deal more time at home with them! The 19th century is my special period of literature and I grew up reading Georgette Heyer, so when I finally found the courage to try writing for myself, the books had to be Regency romances. Over the last four years, writing as Isabelle Goddard, I’ve published six novels set in the Regency period. Since then, I’ve moved on a few years to Victorian England, and I’ve changed genre too. 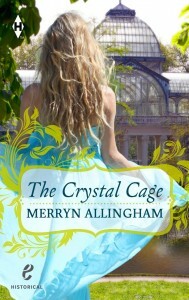 The Crystal Cage is my first novel under the name of Merryn Allingham. The book is a mystery/romantic suspense and tells the story of a long-lost tragedy, and the way echoes from the past can powerfully influence the life of a modern day heroine. The next few Allingham books will see yet another move timewise. I’ve been writing a suspense trilogy set in India and wartime London during the 1930s and 1940s, and hope soon to have news of publication. Whatever period, whatever genre, creating new worlds and sharing them with readers gives me huge pleasure and I can’t think of a better job. I’m a big fan of architecture, history, and romance, so when you combine all three as marvelously as Merryn Allingham has in The Crystal Cage there’s very little chance I’ll be anything but happy. This book made me very, very happy. First, it’s told as sort of parallel plots, a contemporary story about art promoters/historians trying to track down solid information about an architect of import, partly for the sheer satisfaction of finding the truth, but also for – let’s face it – money and notoriety. The three central figures of the contemporary plot form a triangle of sorts, with main character Grace at it’s apex, in a relationship with Oliver, whom becomes less and less pleasant as the story progresses (seriously, I would have walked out on him in chapter two), and Nick whose bohemian lifestyle belies his ability to love and commit. For me, Grace’s personal journey toward finding herself as well as the right partner was just as interesting as the historical mystery, because it was so real, and so believable. Who among us hasn’t fallen into a relationship that seems like a good idea only to become a trap as life goes on. And then there’s the historical love affair with the architect and the object of his affections, though I would argue that he also has a triangle, one where his life’s work is one of the points. Choosing between love and art is never easy, and his story is easily as compelling as the contemporary one. Author Allingham does an amazing job at making each story connect to the other while still retaining period-appropriate language, tone, and action. The events in the past are no less vivid than those in the present, only slightly softened, as if being viewed through a mirror. If you want a satisfying romance with an historical twist, excellent characters, and a compelling plot, I heartily recommend The Crystal Cage. Goes well with Braised lamb shanks and a spring salad. This review is part of a blog tour sponsored by Historical Fiction Virtual Book tours, which is also running a giveaway raffle (see below). For more information, including the complete list of tour stops, click the banner above, or click HERE. To win an eBook of The Crystal Cage please complete the Rafflecopter giveaway form below. Two copies are up for grabs. Giveaway is open internationally. Giveaway ends at 11:59pm on October 15th. You must be 18 or older to enter. Winner will be chosen via Rafflecopter on October 16th and notified via email.